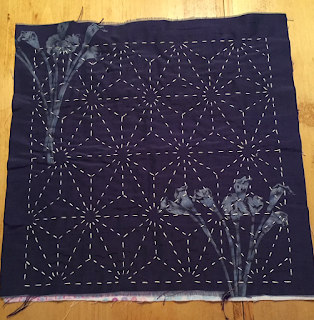 Stitchin' Friends: What have I been doing? I have made progress on some of my other projects, and doing a recap here. 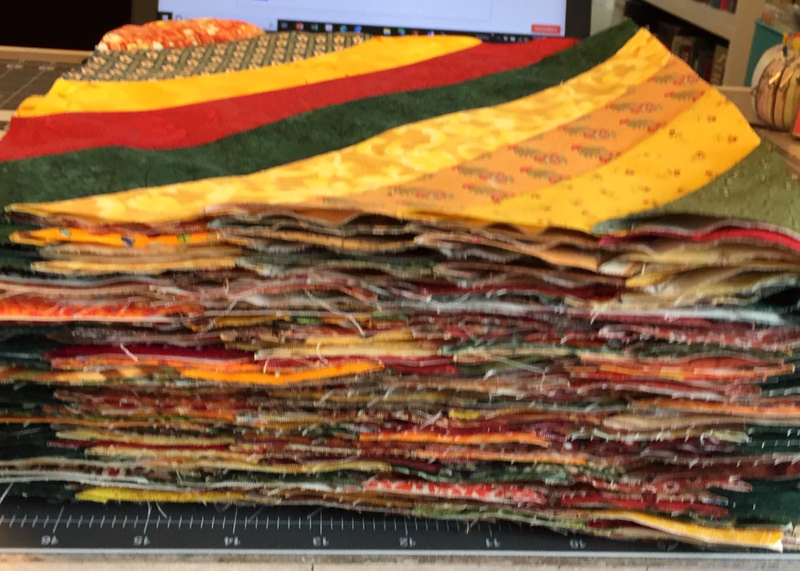 This work has been done in January and February this year, inbetween working on finishing up the hand quilting on the Star of Bethlehem. 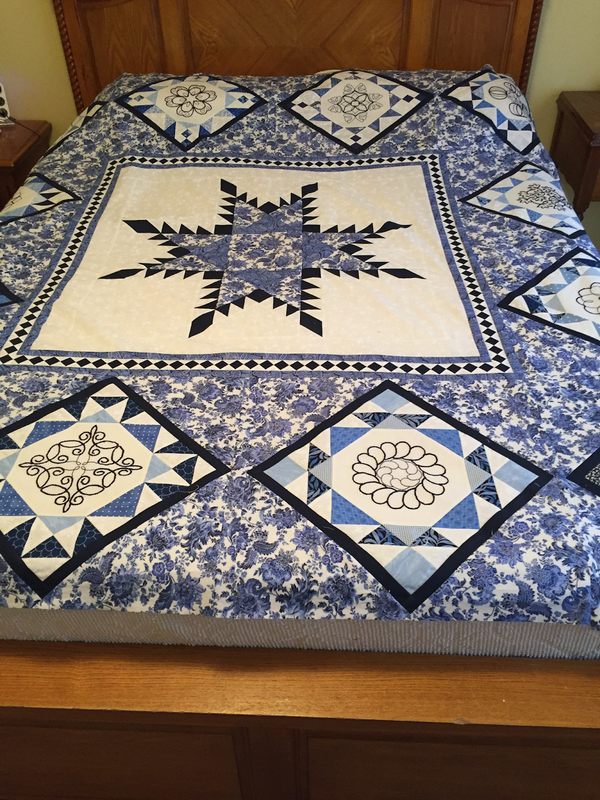 I showed this quilt on an earlier post where I had finished all the border blocks and had the quilt top put together. I decided to add a top border which will be the part that covers the pillows, since I really prefer a rectangular quilt. 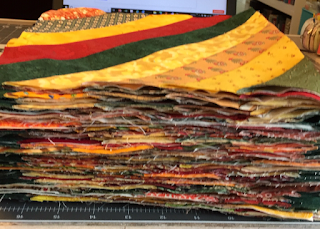 Since so m any of the blocks have twilled embroidery using #8 perle cotton, I decided to carry the embroidery to the top border. I am working on a long (80") border with these twilled roses. I will be adding another border of the Seminole pieced pattern surrounding the feather star section of the top on either side of the roses. I am so anxious to see how this is all going to come out. My guild offered a workshop in Sashiko stitching which can be both decorative embroidery or used as quilting stitch. This the sample I worked on in class. Our instructor, Marge Mitchell, provided a kit with the thread (she used #8 perle cotton), needle (chenille needle #22) and the fabric, which is silk. She had already drawn the pattern on a flannel backing and we actually did the stitching from the reverse side of the sample. This was an enjoyable class and I really like this look and this pattern. I am going to use it on the blue quilt shown above for the backing around the star block. I have three grandchildren with birthdays in February. My little Toby wanted another sock monkey (he got one for Christmas). He was getting another from someone else, so I decided to make a sock monkey pillow case to use as a wrapper for his birthday gift. I think he really liked it, although I don't think he understood what it was. His sister got his pillow and put it in the case and then he understood and seemed very happy. January is the month my club has their winter retreat. We always have a goody bag full of gifts from all the members attending the retreat, most of which are hand made gifts. My friend, Darlene, and I made the large zipper bags to put the goodies in back in the Fall, but I could not show until after the retreat was over. This is my bag, full of the string blocks I have been working on. The bags are approximately 14" x 18". I neglected to get the monogram picture, but my daughter monogrammed each of the bags with her thingie that cuts out plastic lettering. 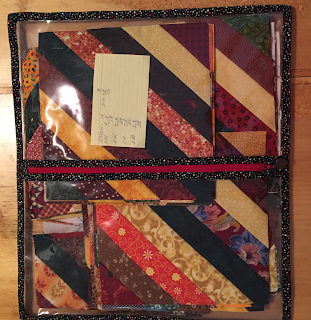 This big pouch was a big hit with the group and I love keeping the blocks in process in it. 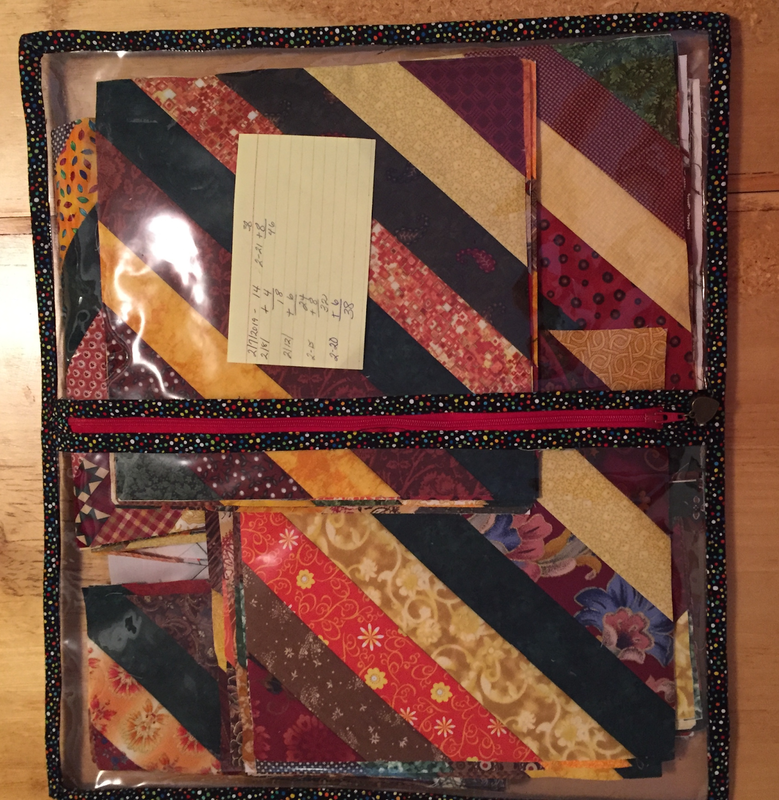 The pattern we used is Work in Progress Bags by Amanda Jean Nyberg of Crazy Mom Quilts. You can contact her if you want to purchase the pattern. Her pattern is for bags 11"x11", 14"x14", 14" x 18" and 16" x 18". And speaking of the string blocks, I completed all 72 blocks on Saturday, March 3 - keeping my mind off the upcoming stress test. I think there may be more than 72 as I kept miscounting. Nothing relaxes me more than sewing, whether it be hand sewing or machine sewing. I guess that's it for now. 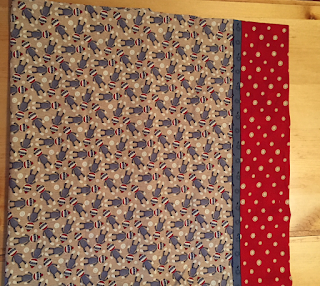 I have also been working on my Pemberley quilt, but that will be a separate blog post. I like that hemp design sashiko. I have used some sashiko patterns for filling in areas on quilts. That feathered star is just beautiful and the added borders will be the frosting on the cake. I also reduce my stress by sewing...jeeze...I should be sewing non-stop!!! !